Pittsburgh, Pennsylvania: A plan from the U.S. Environmental Protection Agency (EPA) to dramatically tighten federal ozone limits will impose new and damaging regulatory restrictions across 85 percent of Pennsylvania’s economy and threaten thousands of good-paying jobs across the Commonwealth, according to a new economic study commissioned by the Center for Regulatory Solutions (CRS), a project of the Small Business Entrepreneurship Council (SBE Council). 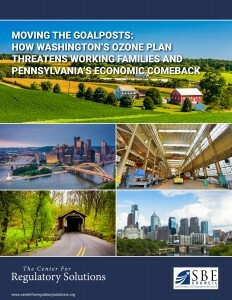 The report, “Moving the Goalposts: How Washington’s Ozone Plan Threatens Working Families and Pennsylvania’s Economic Comeback,” also highlights strong and broad-based opposition to overreaching federal policies that ignore the Commonwealth’s history of environmental progress. Through interviews, letters to the Obama Administration and other channels, a bipartisan coalition of state lawmakers, local officials and leaders of the business and labor communities are sending an unmistakable message to Washington: This ozone plan goes too far. Newly released polling shows that Pennsylvania voters are also wary of unwarranted federal environmental controls over the Commonwealth’s economy and job creators. A statewide public opinion poll commissioned by the National Association of Manufacturers found 65 percent of Pennsylvania voters rate their local air quality as “Excellent” or “Good.” Strong majorities believe stricter federal air quality regulations will: make it harder for local businesses to start or expand (67 percent); increase the price of everyday goods and services (75 percent); and increase the amount they pay in taxes (76 percent). By a wide margin, Pennsylvanians think that less economic growth and fewer job opportunities caused by regulations are a greater problem (68 percent) than low air quality (23 percent). These concerns in Pennsylvania reflect widespread opposition across the country to the EPA’s plan to tighten the current ozone standard of 75 parts per billion (ppb) into the range of 65 to 70 ppb. As detailed in today’s report, local and national groups representing cities, counties, transportation departments, agricultural agencies, state-level environmental regulators, labor unions, construction companies, energy producers, manufacturers and many other stakeholders have all sounded the alarm. These diverse stakeholders are pleading with the EPA to stick with existing 75 ppb standard, which was set less than a decade ago and has yet to be fully implemented. President Obama withdrew EPA’s plan to dramatically tighten the federal ozone standard in 2011, citing concerns about the regulation’s impact on the economy. Local officials, labor union members, businesses and many others are once again expressing these concerns as economic conditions continue to present challenges for many regions of the county and for many industries. By lowering the National Ambient Air Quality Standard from 75 parts per billion (ppb) into the 65 to 70 ppb range, EPA would cause at least 33 counties in Pennsylvania to be in violation of federal law. These are some of Pennsylvania’s most populated counties, concentrated around the Pittsburgh, Harrisburg, and Philadelphia metropolitan areas, but a number of Pennsylvania’s rural counties may be dragged into nonattainment as well. The vast majority of Pennsylvania’s economy, population, and workforce could be caught in the net of ozone nonattainment under the EPA’s proposed range. The 33 impacted counties represent 85 percent of the Commonwealth’s GDP, 83 percent of the Commonwealth’s workforce, and 81 percent of the Commonwealth’s population. Pennsylvania’s power plants will face the dual challenge of more expensive inputs (as this rule will confer costs on energy production) and expenses associated with its own compliance (ie. the purchase of selective catalytic reduction to control NOx) – the end result of this “tax” on industry – is higher residential and industrial energy costs. Under the proposed range for EPA’s new ozone NAAQS, a 10 county region centered on Pittsburgh and stretching up to Erie County would be pushed to nonattainment. The 10 counties that surround Pittsburgh account for 21 percent ($139.4 billion) of the Commonwealth’s GDP and 20 percent of its workforce (1.6 million individuals). The economic burdens from this regulation will hit the hardest in Erie and Mercer Counties where the manufacturing sector represents the largest sector of their economies (14 percent). Four of the 10 counties (Armstrong, Erie, Greene, and Indiana) already suffer from high levels of poverty, ranging from 14.7 to 17.9 percent. All of the relatively non-invasive measures have already been undertaken in this area, and in pursuit of attainment, Pennsylvania will have to apply methods that will curtail its economic growth. In the Harrisburg and Central Pennsylvania area, 14 counties would be thrust into nonattainment. This region generates $104.4 billion or 16 percent of Pennsylvania’s GDP and employs almost 20 percent of its workforce. The economic pain of these regulations will be felt most by Elk County, where manufacturing accounts for an incredible 34 percent of its economy. Other counties that will be hit hard by these regulations include York, Lebanon, and Adams counties, where manufacturing accounts for 14 percent of their economy and represents the largest sector of the economy. Manufacturing also has a significant presence in Lancaster and Franklin counties, accounting for 13 percent each. Four of the 14 counties (Centre, Blair, Cambria, and Clearfield) already suffer from poverty levels above the national rate, ranging from 16.2 to 18.4 percent. Three of these counties suffer from high unemployment rates (Cambria – 6.9 percent, Clearfield – 7.1 percent, and Tioga – 6.8 percent). These regulations would put more people out of work and make it harder for the unemployed to secure new employment. In the Philadelphia and Eastern Pennsylvania area, 9 counties would find themselves in nonattainment. This region is responsible for 49 percent or $322.9 of the Commonwealth’s GDP and employs 3.14 million workers or 43 percent of the Commonwealth’s workforce. The regulations will especially hurt Berks and Lackawanna counties, where manufacturing represents large portions of the economies (13 percent and 10 percent, respectively). Philadelphia County already has a tremendously high poverty rate (26 percent) and unemployment rate (8 percent) and simply cannot afford to lose out on any economic growth as a result of the regulations. Northampton County would similarly suffer with a poverty rate of 14.8 percent and unemployment sitting at 6.6 percent. Two-thirds (67 percent) of Pennsylvania voters believe stricter federal air quality regulations would make it harder for local businesses to start new operations or expand. Three-quarters (75 percent) think stricter federal air quality regulations would increase the price they pay for everyday goods and services, and 76 percent believe tighter federal rules on their local area would increase taxes. By a wide margin, Pennsylvanians think the bigger problem for their local area is “less economic growth and job opportunities caused by regulations” (68 percent) rather than “lower air quality caused by pollution” (23 percent). The Center for Regulatory Solutions is a project of the Small Business and Entrepreneurship Council, a 501c(4) advocacy, research, education and networking organization dedicated to protecting small business and promoting entrepreneurship. For twenty-three years, SBE Council has worked to educate elected officials, policymakers, business leaders and the public about policies that enable business start-up and growth.